She rises also while it is yet night, and gives meat to her household, and a portion to her maidens. “She doth not indulge herself in too much sleep, but is an early riser, before the break of day, to make provision for those who are to go abroad to work in the fields, and to set her maidens their several tasks at home.” (Benson Commentary). “A person will get the best results in every area of life only if his plans are followed by earnest toils” (The Golden Gems of Life). We can not expect to have clean and tidy homes, the clothes laundered and put away, good food shopped for and prepared, and all of the other things required in being a homemaker if we don’t work hard and sleep too much. We must not eat the bread of idleness. Love not sleep, lest thou come to poverty; open thine eyes, and thou shalt be satisfied with bread (Proverbs 20:13). I have always been an early riser. I love being awake before everyone else, having quiet time, studying, and “giving meat for my household” when my children lived in the home or come to visit. I make french toast, pancakes, eggs and toast, eggs with potatoes, or soaked oatmeal. When my children were growing up, I would make homemade muffins and waffles, too. It was important for me that they eat a good breakfast and while they ate, I would read the Bible to them. If you weren’t taught how to cook healthy, study and learn how to do it. There are many resources available through the Internet, cooking shows, and books. There is no excuse to not be a good cook these days and then learn to enjoy doing this since you are nourishing your family’s bodies. As Nancy Campbell wrote, “Don’t look at cooking meals with resignation. Instead, do it with revelation. You have the privilege of feeding your children nourishing food. You are gathering them together around your table again. You are preparing the way to feed their soul and spirit as you read God’s Word at the end of the meal. You are teaching them about life and passing on values to the next generation. There is too much fast food eating in our nation already! It’s not healthy eating and it negates valuable family togetherness in the home. If you don’t lovingly cook meals at home and pass on this tradition, what will the next generation do? Children notoriously wake up early. Most children are in bed by 8:00 pm and then wake up by 6:00 am so it’s important for the mother to go to bed early so she can wake up early with her children to care and feed them after having a good night sleep. As keepers at home, mothers are the ones who are responsible to care for the needs of their family unless they are physically unable. Make sure to teach your children to enjoy going to bed early and rising early. It’s a good discipline to learn. If you have a poor night sleep, depend upon the Lord for your strength. I have a dear and older, godly friend who can only sleep four to five hours a night yet she determined years ago that instead of grumbling and complaining about it, she would be thankful for the sleep she did get and depend upon the Lord’s strength to get her through each day. She is one of the most positive and cheerful people I know, plus she gets a lot done every single day! 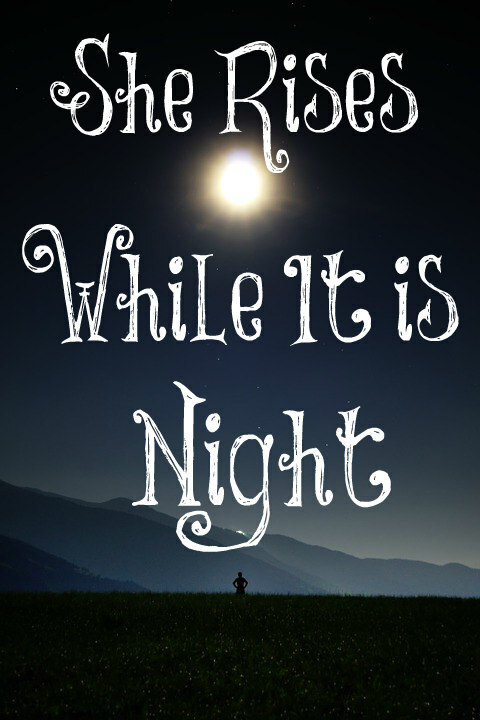 “She riseth also while it is yet night,…. That is, before the ascent of the morning, before break of day; a great while before day, as Christ is said to rise to pray, Mark 1:35; while it was yet dark; so the church here: which shows her affection for her family, her care of her children, and fervent zeal for her husband’s interest and good…with the wholesome words of Christ, with the good doctrines of the Gospel; these have a certain portion given them, and they rightly cut and divide the word of truth, and give to everyone their portion of meat in due season, according to their age and circumstances; milk indeed to babes and meat to strong men” (Gill’s Exposition). Besides giving actual food to your family, make sure you are speaking kindly to them and showing them by the way that you live your life that you are a child of the King of Kings. My encouragement to you is to read the pure words of the Bible to your children from the time they are small since it is God’s living Word rather than children’s bible stories written by men. The Bible is what will transform them and we are instructed to hide it deep within our hearts. Read a few verses in Proverbs and explain it in simple terms when they are small. As they grow older, teach them the doctrines of the faith in Romans and Hebrews. Read through a Gospel and let them be amazed at the life of their Savior. Read Genesis and God’s perfect creation; how it was marred by sin and infected everything on earth by sin’s consequences. When they are more mature in their faith, read to them the end of the story – Revelation. Did you know that we are blessed when we read it (Revelation 1:3)? Let them see the marvelous last two chapters in Revelation about the finality of God’s redemptive plan for all those who call upon His name and the new earth that we will all will live upon one day. Develop in them an awe and reverence for their Creator from the time they are little children. This is the single most important thing you will do for your children as they live under your roof. I just want to comment about early raising. I have struggled with that my whole life. I have had trouble waking up before 10 am no matter how early I went to sleep. School was always difficult and going to work too. I used to sleep on public transit. When I became a homemaker I had a lot of trouble with structuring my day because there is no external pressure to get up early (my husband has very flexible working hours and he’s not a early riser either). A few months ago I hit the rock bottom. My child started preschool in the morning and I need to get up early. I was ALWAYS exhausted and, as consequence, not in a good mood. So I asked my doctor to run some blood tests. It turned out that I had a very severe vitamin D deficiency. I started to supplement with high doses of vitamin D (plus vitamin A from a multivitamin in order to improve absorption) and a magnesium drink. Within a week I was already better. Not constantly exhausted anymore. I can wake up at 7 am without too many problems. I have more energy. If you struggle with constant exhaustion, please get tested. The test is very affordable and supplements are too (even the best brands). It may change your life as mine was. Great advice, Mrs. G. Thank you! I love that my Naturopath tests for all vitamin, mineral, and hormone deficiencies. It seems like something most doctors should do since lacking in these can cause poor health. What a great post! A wife has such an important role as the one who tends to and nourishes her family. There is no time for laziness! There sure isn’t, Amy! Not if she expects to care for her home and family as she is called to do so. I have always been a night owl but during the school year, I get up an hour and a half before the children so I can get ready for the day. We homeschool, so I find that I need to have that time in the morning where I can pray, walk our dogs, start a bit on the housework, and have time to get myself ready. Summer has really thrown us off because I now stay up later with the family and my husband since the children are up later, and I find myself getting up around 8 a.m. Sometimes my daughter is even up before me. I don’t like the feeling of getting up so late, I feel like I haven’t accomplished much. Just wondering, Lori, what time do you go to bed at night…and now that your children are grown, do you still get up early? I go to bed around 9:00 pm and wake up around 5:00 am all year around. I love having the mornings to study and read. When I am with my grandchildren, I am up and caring for them which I love to do. Such a great reminder Lori. Thanks for being so faithful. I can always count on a good post everyday here. I am sure it must take a lot of your time. It is much appreciated! I agree Diane ! Thanks a lot Lori for your work ! It helps me to keep a biblical point of view of my role as a wife and mom, not letting our culture to destroy in my mind what God wants for me and from me !!! Thank you again ! You’re welcome! We are encouraged to exhort one another daily, Daniele, and I know I sure need it because we so easily forget truth and the Lord’s ways if we are not reminded continually. You’re welcome, Diane. It does take a lot of time but as an older woman with no children in the home, I have the time to do it and I love it! I have to admit that I struggle with getting up early as I am a nocturnal person. However, since my husband is an early bird, he has been setting the alarm for 5:30 AM every morning! As a newlywed, who wanted to have a traditional marriage, at first I looked forward to making meals. I have to admit that I’m at the resignation stage, especially since I have a picky husband! Oh well. Little by little. I encourage you to find out what he likes and fix it, Cynthia. My husband is a picky eater but I have found foods that he likes and sticks to those! A year ago my pastor’s wife did a study with us ladies on being a virtuous woman and I purposed in my heart at that time to get up every morning at 4 AM. I have successfully made it a habit and it has helped my life so much. I go to bed early, wake up early, work hard at home and feel like I am finally at peace. I did some tweaking to my schedule over the day to finally get here, but waking up early and spending time with the Lord and then starting my work early has been one of the best things that I have ever done. Great article. Very thought provoking. God bless. Good for you, Wendy. Laine from Laine’s Letters made a commitment to the Lord to wake up in the wee hours of the morning to spend time with Him and it radically changed her life! We are promised that this will happen to any of us who commit to spend time in His Word for it alone is what transforms us. I’ve been waking with my husband between 6-6:30 which i thought was early! It is for me I’ve always been a late riser. Waking earlier make me feel very good, ahead of the day! Although this has inspired me to wake even earlier! I wish I could wake up early! Unfortunately, I’ve always been a night owl, even as a child, and different jobs I’ve had over the years have not encouraged early starts. My children don’t get up very early either – I usually have to wake them at 7am to get up for school. Such great advice though. I will have to work towards going to bed earlier (currently I’m up til around midnight and don’t wake until about 6.30 – 7am, later on weekends) and getting up earlier. I always tell myself I’ll do things in the evening, once the kids are asleep, but I’m always too tired and not productive. I’m sure I would be much more productive if I got up earlier. Pizza, bake the crust first. The Bible does indeed encourage us to rise early. I’m also thinking that I’ve observed so many young mothers that are really harried, exhausted and sleep-deprived, one way we can encourage and lift them up, is to lend a hand in whatever way we can. In Biblical and ancient times women lived in a community, for example, and they helped one another such as with birthing and nursing. Those early years are so difficult, depending on children’s sleep patterns. I’m sure anyone who’s been through it can sympathize. I’ve realised that I have to be careful when talking a young mother. They can be incredibly sensitive and afraid of doing the wrong thing, sometimes they need some love and reassurance that no, there’s no such thing as a “perfect” ideal that they need to measure up to, the important thing is to be “faithful in little” and trust God for the rest.